Eight builders were involved and as it turned out, seven of them are based in the UK and are members of the UK largest LUG, The Brickish Association. If you also live here you can find the seven of us, and a display of models from the book, at this year's Great Western LEGO® Show, at the STEAM museum in Swindon on the weekend of 5 & 6 October 2013. It was a fascinating and challenging process to work on this book. Of the (still remaining) themes available at the time I came on board, I chose "Holidays", which is by no means a subject I've ever chosen to build about before. As it was necessary to use our own bricks, I rapidly bought a lot of Friends sets to expand my somewhat bley-heavy colour range! I highly recommend trying subjects outside your comfort zone and giving yourself a tight deadline - it taught me a hell of a lot. I also learnt that making loads of happy colourful sunshiney stuff is great for your mood. Here is one of my spreads from the available preview pages; not necessarily the one I'd pick as my fave but it is a good example of one of the simpler models with a sprinkling of SNOT. I wasn't alone in exploring new territories - you'll also find a chapter by partners Yvonne Doyle (who I've mentioned previously) and Pete Reid who you may know better for stunning Neo Classic Space extravaganzas and a certain Exo Suit - but here, they're building animals! You'll find loads of nice (and hilarious) piece usage in their chapter, such as the moment when Yvonne uses the brick with a decorative lion's head to create... a lion! 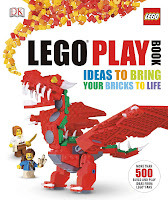 Keen as ever that anything bearing the LEGO brand be of high quality, TLG were heavily involved in the process and early on we were flown to the Billund headquarters for a kickoff meeting and workshop. Here we met the internal team assigned to assist the project plus Design Manager Specialist Jamie Berard, who discussed techniques and then reviewed a few early models we had each brought. That was thrilling, and just a bit terrifying, but luckily he's a charming chappie. Whilst we were not expected to meet the stringent quality control levels that they would apply to official sets with instructions, it was important that we built stuff that kids could conceivably build as well. Essentially this meant not using crazy techniques, always keeping the construction stable and not using rare parts / ones not produced in recent years. So basically all them things wot AFOLs just love to do! Although that took a little getting used to, it didn't spoil the fun by any means and has had a positive impact on my building style. When stuck during a build, I'd catch myself trying out ever-more complex techniques to get around the problem. But lo, by going back to System basics and rebuilding, the issue would almost always be resolved. Gee... it's almost like there's some kind of system to this System! 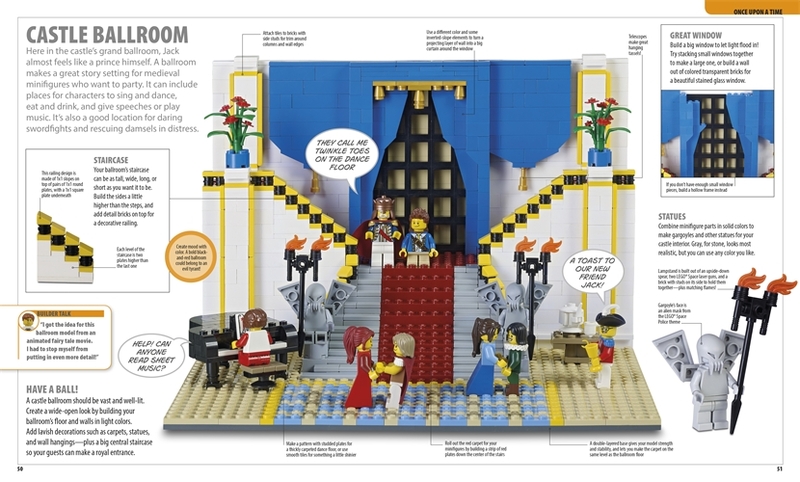 I've always enjoyed working within constraints and so behaving closer to the way actual LEGO Designers do was fascinating and worthwhile. 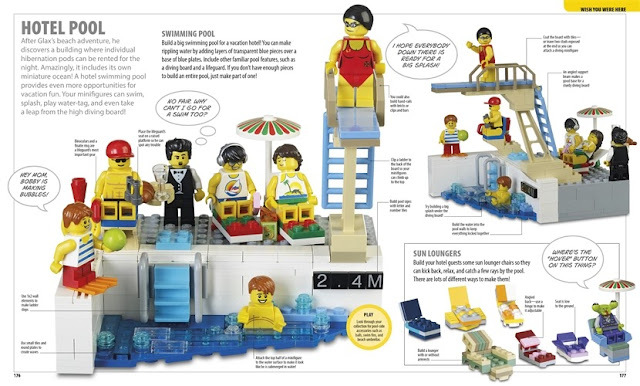 Photos were sent by the dozen during development to LEGO Designer Melanie Louise Caddick (AFOLs may perhaps know her best for designing the wonderful 2011 Inside Tour set Moulding Machines) who was assigned as our Model Coach. Once we were pretty much all done, she and Building Instruction Developer Alexandra Martin came to London for a busy couple of days. Our models were reviewed in the flesh and revisions requested - but the vast majority got approved first time around. Relief! The only other models I saw during my assigned afternoon were Rod Gillies', a.k.a. 2 Much Caffeine, whose chapter covers all things spooky and scary, with plenty of gorgeous imaginative vignettes. As if being known for stunning steampunk and microscale Star Wars models isn't enough, Rod is also the author of two steampunk novels . DK then set about the lengthy process of photography and layout, and have done a stunning job. I especially noticed how beautiful the parts look when reading Tim Goddard's "Microscale" chapter, where models containing just a few dozen elements sometimes fill double-page spreads. Tim previously worked on the initial "LEGO Ideas" book and you may know him as Rogue Bantha on Flickr where microscale and Neo Classic Space are recurring subjects for him. 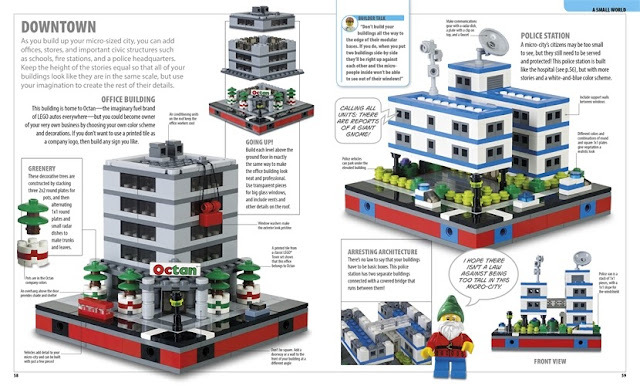 Tim and the aforementioned Mr Peter Reid have a book of their own coming out soon called "LEGO® Space: Building the Future" and from what little I've seen so far, it looks simply stunning. It's due out on October 30 and can be pre-ordered now. Another returning builder from that first book is the hugely talented Barney Main a.k.a. SlyOwl, here building a Fairy Tales theme which makes for a charming collection of models. DK did a superb job tying our models together with a loose story led by a minifig (mine features an alien studying Earth habits!) but Barney's has a stronger narrative thread than the other chapters which adds further to the personality of his work. Today is the official release date of the English version - I believe translations are coming but haven't spotted them yet. If you want to buy a copy, I'm sure you already have your favoured routes to purchase books but I've created some affiliate links below that you can choose instead if you wish. Clicking these links and then buying from these sellers means that the seller sends a small commission to me. I've also decided to add affiliate links elsewhere on this blog - not so much a plunge into advertising as a toe in the water. It hasn't been a simple decision but the key factors are the huge amount of my time that's required to post regularly, and the fact I need money to run this blog - right now for example I need a proper lighting setup and would like some digital calipers to better assess new elements! I encourage you to let me know any opinions you have about my decisions via email (form is on the right) or by commenting. Just to be absolutely clear about my intentions, I've also added a Disclosure Policy which is increasingly becoming the norm, in the US anyway. If you want some more glimpses of layouts, here's a US promo video. I love all things modular, and that graveyard is no exception! 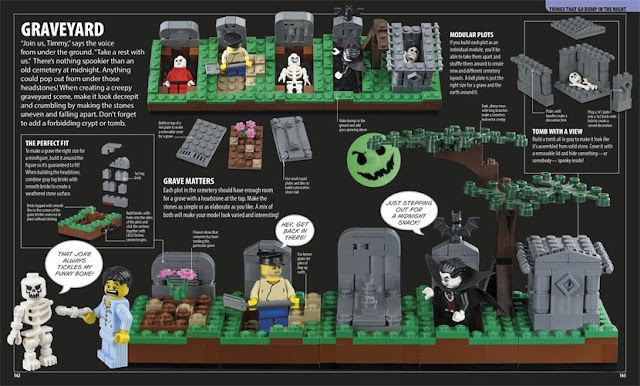 We all need a modular graveyard. Cool. I saw a copy in-store at Barnes & Noble two days ago, and didn't realize that it was a tad pre-release. Apparently it's quite common to sell before release dates. Some online stores have been shipping for 3 weeks now. Anyway, congratulations to you and the rest of your cohort who worked on this. Nice write up Tim, I'm looking forward to putting our models out on display at Steam! It's really great to see the inclusion of Micropolis into the micro-scale section, but I'm a bit curious why they decided to use the beta version of the spec (technic holes near the edge of a side rather than in the middle). I sent a message on Flickr to find out. Regarding digital calipers, stick with something in the 6" range. A quick check on Amazon shows several different options in the $10-20 range, but when you start getting into longer versions you can quickly hit the $100 range. Frankly, there's not going to be many instances where you'll _need_ a longer set of calipers when dealing with the LEGO system, and given that you can get a servicable 6" set for practically nothing, even if you do decide that you absolutely must have a longer set at a later date, it won't feel like you wasted a lot of money on the short set. Even 12" digital calipers aren't a huge hit to the pocket, with sets available in the $30-40 range, compared to dial calipers which can run over $100 for the same size. However, if you use the 6" set for the grunt work and save the long set for times when you really need them, you'll find that not only are you less likely to drop them (short calipers are much easier to handle), but you won't have a heart attack when you see them hit the floor. Great advice PD... glad I mentioned it. Good to hear I can happily go for the 6". Thanks! My copy is on order. Can't wait.